When I was out of the country during the past few weeks, I couldn't resist the opportunity to resume my Spinning Indie radio station field trip series by visiting a few student radio stations in Ireland. First up was Belfield FM, the student radio station at University College Dublin (UCD). Located just outside of Dublin in the town of Belfield, the station itself is hidden away on a corridor just off a tunnel adjacent to the James Joyce Library. During the 2011-2012 academic year the station is broadcasting on 107.8 FM and online. An interesting thing about many student radio stations in Ireland is that some of them bounce around the FM dial and aren't on the same frequency from year to year. Each year certain stations apply for a frequency and last year Belfield FM was only on FM for a total of 4 weeks. The Broadcasting Authority of Ireland (BAI) is the regulatory agency that handles radio licensing in Ireland. The BAI allows for temporary radio licensing, which is why a number of stations operate for only a few weeks out of the year. A recent list of temporary sound broadcasting applications (PDF) includes Belfield FM, which is licensed to broadcast Mondays through Fridays. Currently they broadcast from 1pm to 9pm from a transmitter atop their campus building, although most of their listeners tune in online. Some other college radio stations in Ireland, including Spinning Indie field trip stop FlirtFM, are designated community/special interest broadcasters and broadcast on a more permanent basis. Student radio has been a staple of UCD since 1990, although the name Belfield FM wasn't introduced until 2006. In the early days, they only broadcast terrestrially for 4 to 6 weeks out of the year and the station shut down for several years before relaunching. Since 2008 the station has been in its current location, but it's scheduled to move to a new Student Center on campus in September. Its new studio in the Student Center has already been built and they should have access to it by April. They will continue to use the current studio as a production studio so that DJs will have the ability to pre-record their shows. I visited Belfield FM on the afternoon of Monday, January 16, 2011, which was the first day of broadcasts for the new semester. Although I knew the general location of the station, I still had a difficult time finding it since the door to the station only contained a tiny handwritten sign on a ripped scrap of paper reading "Belfield FM." The volunteers who I met with told me that every year the station is a stop of a campus "treasure hunt" and acknowledged that they should probably make a bigger sign. Belfield FM's small space contains an office with a couch, desk, and broadcasting equipment as well as an adjacent studio. Although the surroundings are spartan, the station has around 80 volunteers including approximately 50 regular participants. When I visited, 4 DJs were hanging around the office and it was fun hearing their stories about the station. Station Manager Peter Branigan toured me around the station and was joined by the Executive Producer of BeatsanPieces Dylan Gray, Assistant Manager Oisín Boyce, and Assistant Manager Darragh O'Connor. They all pointed out the great sense of community that they've felt at Belfield FM and mentioned that they've met many of their close friends through the station. They also mentioned that many students on campus are interested in coming in to the station and that they frequently have friends asking them about radio. The station isn't connected to an academic department at UCD, instead existing as a student club that is funded by the Student's Union and student fees. DJs have a lot of freedom and there are a range of shows on-air, from music shows, to talk shows, to sports programs. There aren't too many restrictions other than not swearing (they told me that there are 5 dirty words in Ireland) or defaming anyone over the air. DJs keep track of their playlists on paper, but those lists aren't used for any sort of charting. Although there isn't much in the way of a music library other than a small drawer full of CDs, most of their material has been digitized and Belfield FM has a digital music library containing nearly 16,000 tracks. Most DJs bring their own music and frequently play material and music off of You Tube. CD players are also available for DJs to use, but there are no turntables or tape decks in the studio. Live bands also come to play at Belfield FM, particularly on the "Unsigned and Underrated" show. There's also an "International Music Show," on Friday nights at 5:30pm, "School of Heavy Metal Studies" program on Wednesday nights at 5:30pm, and an "Electro Show." Darragh O'Connor also hosts the "Wrestleview International Desk" program which delves into the world of wrestling. Belfield FM has also produced a number of live broadcasts, including sabbatical debates, which they broadcast from a nearby campus theater by running wires from their studio. They just got funding to purchase an outside broadcast unit, so the station is hopeful that it can air more live events, including sports commentary. I'm always interested in the nitty gritty details about a station's operations, so I was excited to grab a copy of the Belfield FM Broadcasting Bible from 2009-2010 (a copy of which can also be found on their website, along with other materials for volunteers). According to the Broadcasting Bible, "We want to provide the students of UCD with an accessible forum for information, debate and concerns relevant to all aspects of student life, and to create an awareness of the student community among the wider population of the city." Thanks to everyone at Belfield FM for showing me around your fine station! Stay tuned, my next stop in the Spinning Indie field trip series will be to another student radio station in Ireland. It's hard to believe that it's already been a year since KUSF was taken off the air by officials at University of San Francisco. 2011 was marked by a year of protests and actions by KUSF supporters, as well as by the launch of KUSF in Exile in order to keep the spirit of KUSF alive. 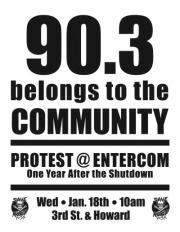 Tomorrow, in honor of the anniversary of the shutdown, there will be a protest at 10am (the time that KUSF turned to static on January 18, 2011) at Entercom headquarters in San Francisco. The programming now airing over KUSF's 90.3 FM signal (classical station KDFC) is originating from Entercom headquarters. KDFC (now owned by Classical Public Radio Network) used to be a commercial classical station owned by Entercom. The January 18, 2012 protest will take place from 10 to 11am at 201 Third Street (at Howard). Later that evening, there will be an after-party at WIX Lounge (3169 22nd Street, between Capp and Mission in San Francisco) featuring guest speakers and KUSF in Exile DJs spinning records.